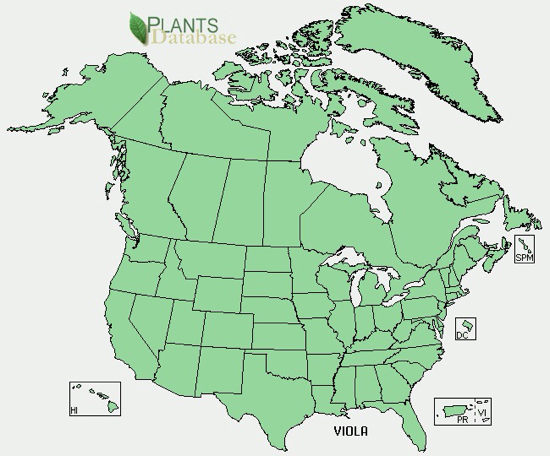 Violet (Viola species) is one of those plants that are deceptively powerful. From first looks, they appear to be very delicate but are in fact both a very powerful source of food and medicine. Right now in May is typically the peak time for picking violet flowers. One thing that’s really cool about these wildflowers is that Violet isn’t harmed when you pick its spring blossoms. These spring flowers don’t produce seeds anyways and what happens is the more you pick the more actually the plant gives you. These “flowers” that you see around this time are not the true flowers. The true flowers of the violet bloom in the fall and I actually very hard to spot since they’re very close to the ground. The first step before eating any wild edible is to positively identify it. Vertically symmetrical five-petaled flower: if you were to cut a line or draw a line through the middle of the flowers in a vertical fashion it would be symmetrical on either side of this vertical line. Flowers are about 1/2 to 1 inch (1 1/4 to 2 1/2 cm) wide, and can be found as blue, deep purple, yellow, white, or actually a combination of these colors on the same flower. Heart-shaped, deeply veined leaves: Most species of violet have these heart-shaped, scalloped simple leaves. You may find that the lower leaves are round at the tip while the upper leaves are pointed. Violet prefers to grow in shade and will spread through both seed as well as runners. It is a perennial plant and includes many different species all of which have medicinal value. I find them most of the time in suburban lawns and roadsides. Violet is a very nutritious wildflower. The leaves and plant contain a lot of vitamin C, vitamin K, iron, and rutin. In fact, 1 ounce of violet packs almost double the amount of RDA for both vitamin C and vitamin A. Both the leaves and the flowers are edible and make a great addition to salads eaten raw. It’s best to eat these in the spring when the leaves are still tender since by the fall they become tough (the tougher fall leaves are great for medicine). Both the flowers and leaves make an excellent expectorant for treatment against coughs. In fact, just yesterday I had made a violet tea to help with my cough which I no longer have. Violet has also had a long tradition and reputation as an anticancer herb, especially when used as a poultice for cancers on the skin. There are also some promising studies in laboratories where Violet has helped to reduce tumors in mice. Heat up some water to boiling and while that’s heating up, “preheats” your mason jar by putting it under hot water from the tap for a minute or so. Once the water is boiling put the dried Violet leaves into the mason jar and fill up the jar most of the way to the top with the water. Seal the jar with a lid and let this infusion steep for a good 6 to 8 hours. After that time, strain off the leaves and the resulting infusion (tea) and can be drank hot, cold, or at room temperature. You’ll need to drink this within two days so keep it refrigerated until you want to use it. Thank you for this information. I have dark purple Violets all over in my yard, one of my neighbors has light purple, so i have been rescuing them and moving them to a protected area under my Rose-of-Sharron bush. I knew that they were beneficial, but couldn’t remember what for and haven’t had a chance to get time to look it up yet. I will be utilizing them from now on, they will be one of the many staple items in my Emergency Garden Kit and Med Bag. As well as for lunch today! 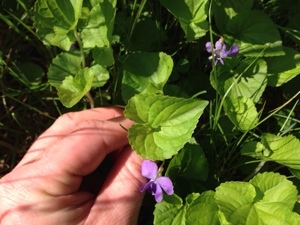 I have a very FEW wild violets in my pasture but the animals usually get them before I can. 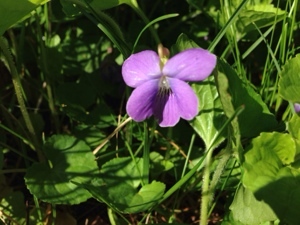 I had bought some “two colored” violets at Walmart or Lowes (forgot now) and planted them in my yard. Are they edible just like the wild ones? As long as you’re sure it’s from the family Viola then it will be edible AND medicinal. The ubiquitous pansy that we see in every nursery and even outside grocery stores are members of the viola family, and have all the same wonderful attributes.